Regular readers of this blog must be tired of the same old, same old colours – Burnt Sienna, Yellow Ochre and Prussian Blue . Well, sorry to dash your expectations of excitement, its the same old colours again. Well thats not quite true, the yellow in the cottage windows is a tiny bit of Cadmium Yellow plus white. As in previous paintings, whenever I need a colour which is not part of the natural spectrum (the red tractor, the people going to church), I use a colour out of the normal harmonious range. This colour does two things, it says man-made and it stands out from the other colours. I was planning to put a ribbon of smoke coming from the cottage. As the sky progressed I changed the plan, smoke would not be visible on the irregular pattern of bright colours which is what the sky turned out to be. The sky changed from what I intended. It was to be flat and brooding with wisps of white cloud scurrying across a cold blue sky. A more solid structure presented itself, and being an opportunist, that’s the way it went. 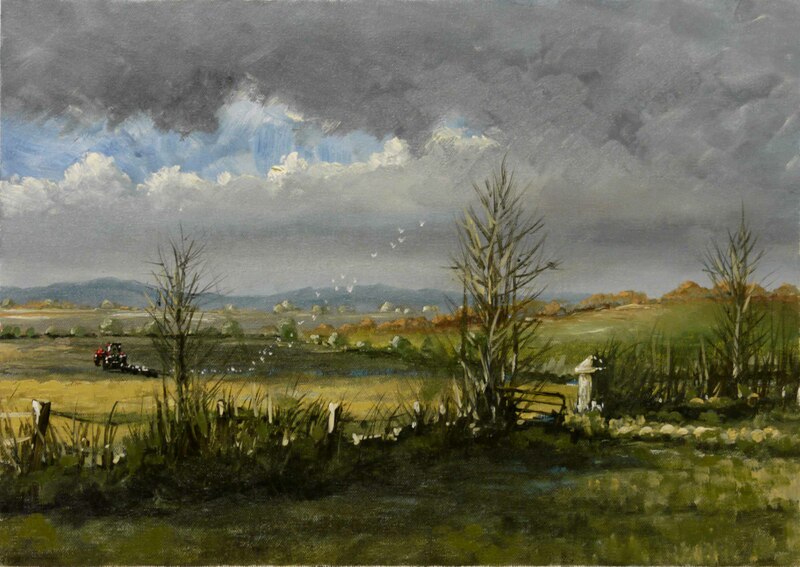 The ‘knock on effect’ was that the fine lines of the beech trees on the left would be impossible to paint onto the thick layer of sky colour. If the painting, at this stage, was allowed to dry, there would be no problem. I could paint on top and even make corrections by wiping of the fresh paint with a tissue soaked in a little white spirits. But as this was to be a single session painting the solution was to ‘draw’ the trees with a palette knife into the wet layer of paint. Into these ‘channels’ the darker colour of the trees was placed. The paint was very liquid, with loads of white spirits, and ‘flooded’ the channels producing a clean sharp line. Any of the ‘scratches’ not painted in looked OK as well. As usual I’ve videoed the process for a future post, so check back in a few days. Too cold, see you later! P.S. I took this photo last Christmas Eve. 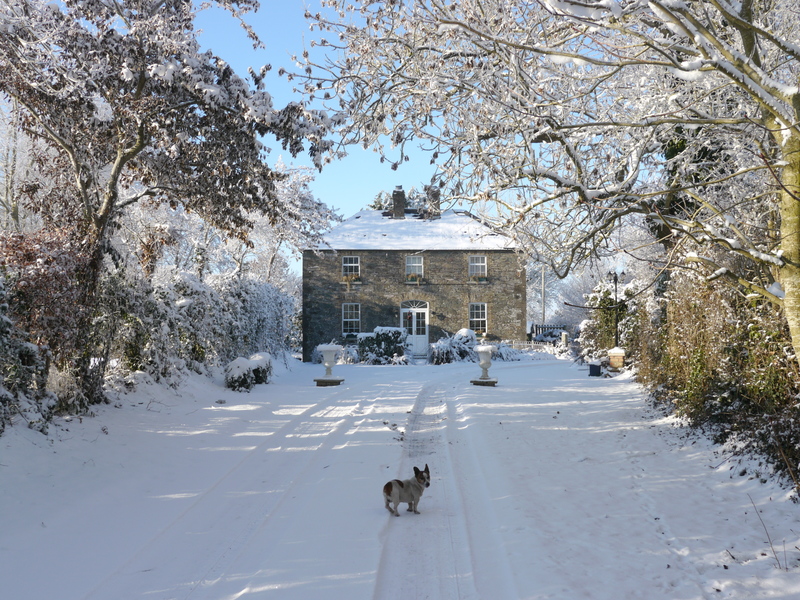 I was photographing a rare occurrence, a ‘white Christmas’ (very rare in Ireland). The little dog is Zuppy, our old Jack Russel terrier. It was so cold on that day, he just stopped walking and gave me the ‘slow look’. He then headed back to the bed. The silhouette of the dog against the snow was an image looking for a painting, and this painting was built around it. The fox, being careful to avoid the cottage, was caught ‘off guard’ by the viewer. Here and there, scattered across the Irish landscape, you’ll find what appears to be the ruins of formal structures. Usually well made ‘cut stone’ walls or gateway, the remnants of the 18th century estates. Many were abandoned or acquired by the State, to be split up and distributed among the former tenants, after the break with the United Kingdom in the 1920’s. This finely constructed gate post and overgrown remains of a stone wall is an appropriate foreground for this painting of the closing of another year. The ploughing of the stubble fields after the harvest is a harvest for bird life. Seagulls travel from the coast to feed on the morsels turned up by the plough. The colours are the same as before: Burnt Sienna, Yellow Ochre and Prussian Blue. Also used, Raw Umber and Cerulean Blue. Cerulean Blue because Prussian Blue is dark and purple and is moderated nicely by the lighter blue. Although a spot of Cadmium Red was used for the tractor it wasn’t part of the overall colour in the rest of the painting. This spot of colour stands out from the surface and when it dries I will trim flat the lump of paint and possibly scrape off a little to help with the shape of the tractor. That ‘shaved’ red paint will really stand out from the rest of the painting which is needed to draw attention to the tractor. Its such a small item it needs an attention grabber. 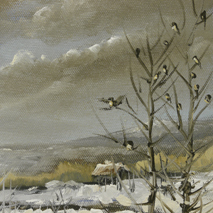 Subconsciously, the viewer enters the painting somewhere on the left, the tractor grabs the eye which will then travel with the birds and leave the painting over the hills on the right. Subsequent journeys may take the viewer to the gatepost and into the field, which is OK . There is an overall green/brown colour in the painting, good for late Autumn. The green was a mix of Yellow Ochre and Prussian Blue. The blue is added to the yellow, in that order, as it is easier to check the ‘greeness’ of the mix going from the yellow (this might sound weird, but it is not). Remember from a previous post about mixing greens as opposed to using green straight from a tube – the ‘mix’ green is always more natural, better for landscapes. On the subject of mixing colours, one mix which will always be required in a landscape is the mixing of a blue and white for the sky. Always, always add the blue to the white, never the other way round. The bulk of the mix will be white, so adding little bits of blue until the colour is right ensures you don’t end up with a huge lump of sky blue mix. Also, like in the green mixing above its easier to check the colour of the mix coming from the white. There is a video in the pipeline for the next post. See you then! Placing figures in a landscape, for me at least, is always problematic. I’m fascinated by artists who paint figures first, then fit the landscape around them. This seems to be the logical way to do it. 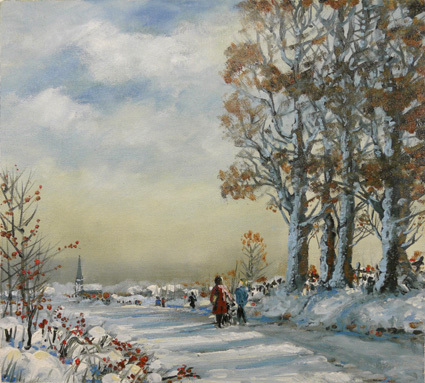 In this painting, although the story is of the Christmas Morning church goers, the figures are incidental to the scene, so their placing is better in an already finished landscape. As you can imagine, painting wet on wet, adds a few more problems. I would plan the figure as a separate sketch, experimenting with different figures and their sizes before attempting to paint them in. As in the previous painting, by lightly ‘scratching’ the figure on the wet paint the correct size and shape of the figure can be worked out. When the correct ‘drawing’ is made any unwanted marks can be repaired by lightly reworking the wet paint. Also, if there is a heavy layer of paint its advisable to scrape this off before adding the paint of the figure. Wet on wet does not allow for errors, so be careful. It sounds like a pain in the neck, but as you can see in the video its not that daunting. 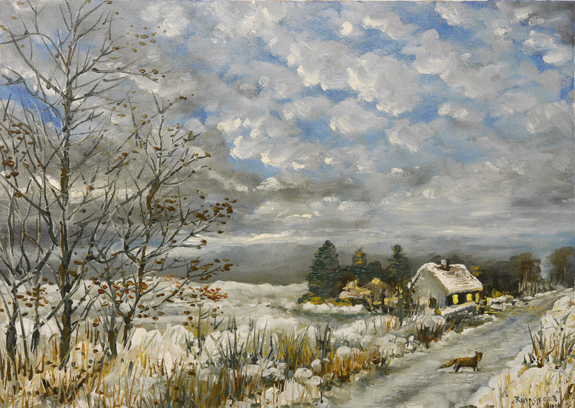 I will be printing the Christmas cards (this painting and previous one) next week. I will include observations and a few photos of the finished product in future posts. Here’s the video of the painting of above picture. The Christmas tradition of exchanging cards goes back to Victorian times and I think is particularly enjoyed by children. I still remember some scenes on cards from my childhood and the fantasy worlds depicted contributed greatly to the spirit of Christmas. 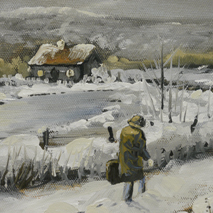 So when I paint a scene for printing as a Christmas card I try and make a scene which will be memorable by children. Not the ‘sugar coated’ Hollywood images but real worlds telling a small part of what makes this time of year special. The colours are exactly the same as the previous painting. But the scene is completely different. Burnt Sienna, Yellow Ochre and French Ultramarine, plus Raw Umber, black and a lot of white. The treatment of the sky is similar, also, to the previous painting. Placing the shapes in position and using swift strokes of the brush to create random shapes and avoid unwanted regular patterns. Painting snow scenes are tricky. A scene can become too white and lack shadows which define the scene. 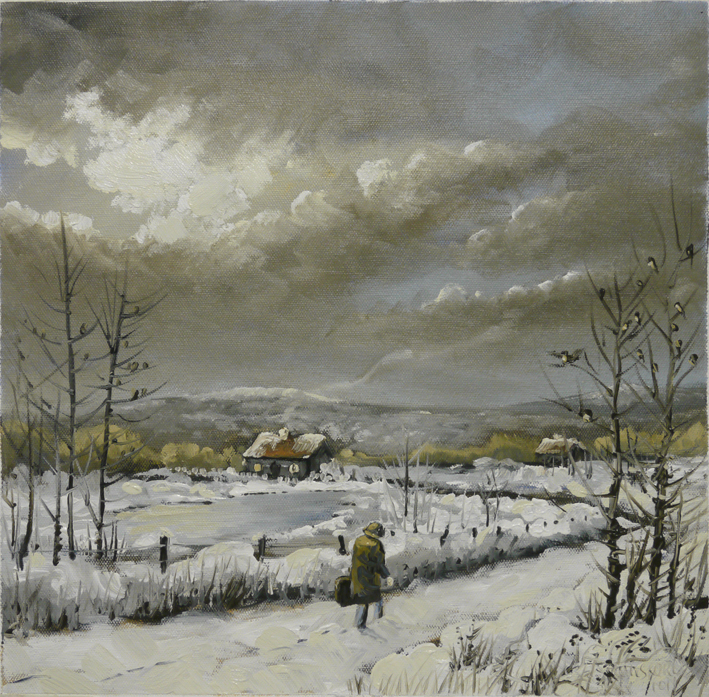 My approach is to paint the scene ‘under the snow’ with solvent only and not bother too much with light or shade or even the details of the landscape. Then when placing the white there is a bit of mixing with the underlying wet paint. This helps avoid the ‘washed out’ effect you get from placing white (or even tinted white) directly on the dry surface. The amount of mixing with the underpainting can be controlled by the amount of ‘working’ of the white on the underpainting, so subtle tints and shades pop up all over the place. If you are considering having your own cards printed there are a few points to consider. The first is the shape. Regardless of the size of the painting its the shape of the painting which should be decided first. Because envelopes are produced in a limited range of shapes. There are ‘on-line’ companies which specialise in this business but unless the initial shape approximates the final size, the scene could be truncated, or worse, distorted to fit the standard shape. In a previous post I discussed other matters relating to artwork for printing. As usual I videoed the painting (which took about 2 hours in a single session) for the next post. You might think I’m a bit premature with thoughts of Christmas, but now is the time for preparations especially for the slow drying oil paintings. And remember, making the Christmas cakes will also be starting soon to have a well matured, whisky preserved treat to brighten the dark days of Christmas.